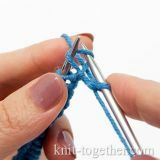 Knit Together | How to read crochet charts and how to crochet the stitch patterns. 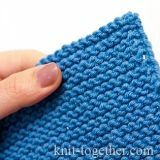 In this chapter - how to crochet the stitch patterns with a charts on our site. 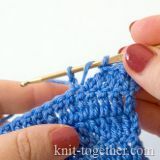 As a rule, the crocheting starts with group of chain stitches which form a chain. The chain is indicated on the diagram, but it isn't consider as row. The first and next rows are numbered on the crochet chart. The charts were given for crochet in row (not in round) and the right side rows are odd, if in the description of the pattern not specified otherwise. We read the charts from right to left in the right side rows, and from left to right in the wrong side rows. Numbers of odd rows are shown in the chart on the right, even numbers - on the left. We don't show a repeat (rapport) by horizontally in the crochet chart, but we show it as an asterisk (*.....*) at the beginning and end of the rapport. This means that a fragment of pattern enclosed between the asterisks is repeated. Before and after rapport we can show stitches for the symmetry of the pattern. 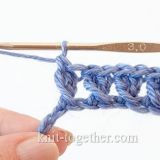 If group of different stitches is made in same loop or space, in this case, it can be enclosed square brackets: [1 single crochet, 2 double crochet, 1 single crochet] in space between two chains of the previous row. Also in the description of the stitch pattern indicates the rapport by vertically (the number of rows after which the pattern repeats). The turning chains, which form smooth edge, are also indicated. The number of these turning chains depends on the height and location of stitches forming a pattern. The characters, denoting certain stitches you can see in the section: Crochet Chart Symbols. 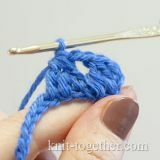 If the name of the stitch is an active link, you can go to link and see how to crochet the stitch. Crochet the stitches need through both loops (under front and back loops or in both loops), if not specified other in description of patterns. 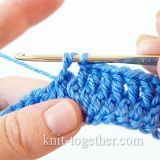 Learn more about the different ways crochet stitches. Bundles of stitches (two and more), coming from the same loop are indicated as coming from the same point. The bundles of stitches which were made in the space are indicated as coming not from the same point, but at some distance from each other. For example, in this crochet chart: In the first row the bundle of six and four stitches are made in the chain stitch, but in all next rows - in space between stitches. Three chain stitches by edge - it's the turning chains. The chart for crochet in row you can use and for crochet in round (without turning the work in the end of the row). But in this case the even rows, as and the odd rows, we read from the right to the left, since we always working by the right side. Herewith the nature of pattern will vary slightly, as the stitches with the right side and wrong side look a bit different. 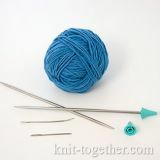 For readability of the crochet chart, we sometimes denote even and odd rows in different colors: black and blue. In the circular charts, which consist of several identical sectors we may show only one, for example, as in this chart of the irish rose. In the circular chart we indicate how many time repeated a rapport. For example: 1 row: 6 chains, * 1 double crochet in sliding loop, 2 chains * - repeat 7 times. This means that a fragment of pattern enclosed between the asterisks need to be repeated 7 times. 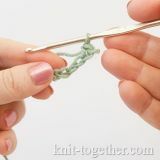 If you have any questions how to crochet the stitch patterns, you can ask them by sending us a message.